They prepared the room beautiful romantically for our special occasion. The location is just fantastic. Very friendly staff and very helpful. Big rooms and comfortable. Amazing location just off the main plaza in downtown Dresden. Close to the Green Vault and next to the transportation museum. Located behind the concert hall and plenty of restaurants and cafes. The apartment was large with two good rooms and a full kitchen. Plus, the balcony overlooked the Church of our Lady in the middle of Dresden. Beds were not like typical European beds with the split. True queen sized beds. The location was extraordinary, we actually got a free upgrade to one of the much nicer apartments with a view of the Frauenkirche, one of the biggest landmarks in Dresden. The hotel is located in the center and most of the landmarks are with a walking distance, which is a really great thing! The staff was really nice and helpful, they explained everything we needed to know. The apartment was clean and quite comfortable. Everything, especially the staff in the reception. (Herr Udo). He was bery kind and nice. Clean, comfortable, great location. Washer and heated drying rack. Overall a good value. We were a group of 3 and had a 2 room apartment. Very spacious. Close to everything: Christmas markets, museums, cathedrals, cafes. Staff at checkin helpful and efficient. Perfect location in Alt Stadt for each access to sights. Room extra large and mini-kitchen very nice. The place is large and comfortable. The location was fantastic. We were upgraded to a 2 bedroom apartment on the 4th floor overlooking the Frauenkirche Dresden. We were able to take advantage of the clothes washer. Everything! Excellent location, kind staff, wonderful apartment. Lock in a great price for Aparthotel Am Schloss – rated 9.3 by recent guests! Aparthotel Am Schloss This rating is a reflection of how the property compares to the industry standard when it comes to price, facilities and services available. It's based on a self-evaluation by the property. Use this rating to help choose your stay! 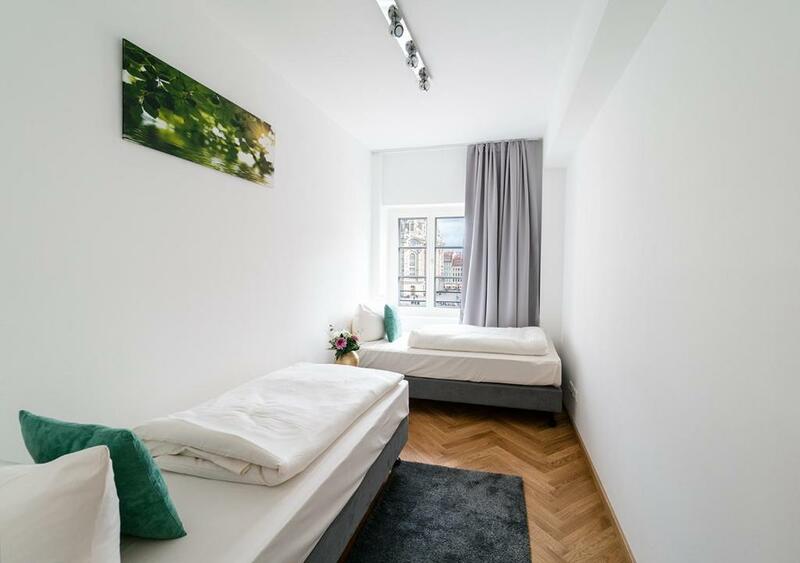 One of our top picks in Dresden.Featuring free Wi-Fi, these stylish apartments are a 5-minute walk from the historic Frauenkirche Church. Guests can enjoy access to the roof terrace, which offers views of the courtyard and the Kreuzkirche Church. Decorated in soft shades of pink and cream, these apartments feature a sitting area with a flat-screen TV. A hairdryer is provided in the modern bathroom, and some apartments are wheelchair accessible. Many of Dresden’s main sights are within a 10-minute walk of the Am Schloss Apartments. Dresden Transport Museum is a 3-minute walk from the apartments, and the Zwinger Palace is a 5-minute walk away. Postplatz tram stop is 950 feet away, and provides connections to Dresden Central Station. The A4 road can be reached in 15 minutes. 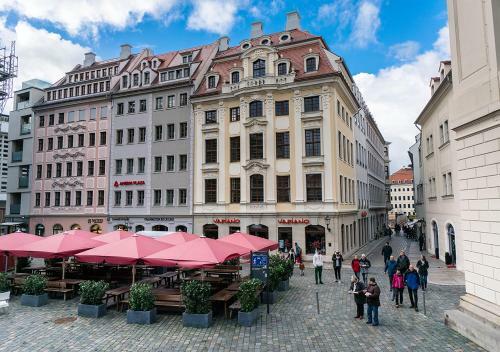 Altstadt is a great choice for travelers interested in churches, museums and history. 뀐 Located in the real heart of Dresden, this property has an excellent location score of 9.8! 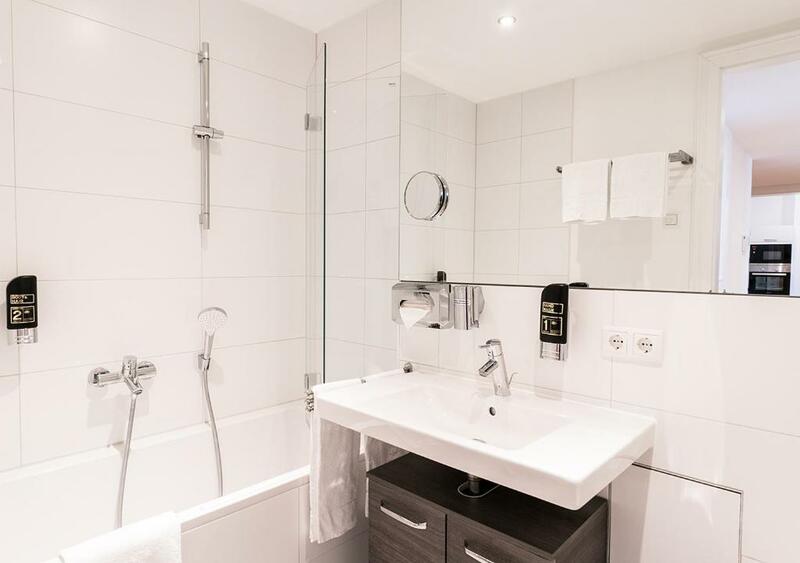 When would you like to stay at Aparthotel Am Schloss? Stylish studio featuring a living/sleeping area, a flat-screen TV, and kitchenette with a dishwasher. Stylish apartment featuring a separate bedroom, a flat-screen TV, and kitchenette with a dishwasher. 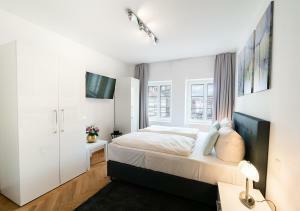 Stylish studio featuring a living/sleeping area for 3 people, a flat-screen TV, and kitchenette with a dishwasher. This spacious suite has a separate living and bedroom, a fully equipped kitchen with a dining area, and a bathroom with a washing machine. Maximum of 4 guests allowed. The entire Aparthotel captivates the visitor with elements of ballet. The house pays homage to ballet dancers such as Gret Palucca who used to perform in Dresden. 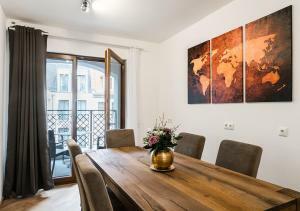 The stylishly furnished apartments feature a living and sleeping area as well as a fully equipped kitchen including dishwasher and a bathroom with shower. The Aparthotel „Am Schloss” is a Non smoking hotel. The hotel is a private property and owned by the family Drescher. They renovated the hotel with much love and inspired by dancer and ballet. The hotel is located directly in the city centre, in walking distance to all major sighting areas. Area Info – This neighborhood is a great choice for travelers interested in churches, museums and history – Check location Excellent location – show map Guests loved walking around the neighborhood! Since World War II, Dresden's old town has been lovingly rebuilt and is once again a European treasure. The Frauenkirche and Semper Opera House are two awesome rococo monuments you can't miss. House Rules Aparthotel Am Schloss takes special requests – add in the next step! Aparthotel Am Schloss accepts these cards and reserves the right to temporarily hold an amount prior to arrival. 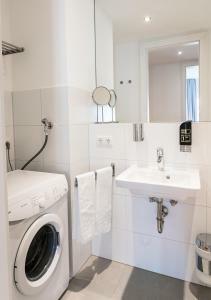 Please note that Aparthotel Am Schloss does not offer a daily cleaning service. Bed linen and towels are included in the price. Please also note that breakfast is served in the Restaurant Gasthaus Am Neumarkt, 1,950 feet away from the apartments. Pets are charged an additional EUR 15 per night. Please inform Aparthotel Am Schloss of your expected arrival time in advance. You can use the Special Requests box when booking, or contact the property directly using the contact details in your confirmation. Excellent location. Clean and safe. Proper mattresses! And more healthy selection at breakfast. Everything was great except the beds are not comfortable, and 2 single mattresses pushed together is not a double bed. Extra taxes. They can be added to booking price. The location was fantastic. I had a wonderful view of the Frauenkirche. Only one bathroom for up to six people. We traveled with 4 adults and two 11 year olds so really no issue. But any more adults you’d need another bathroom. This is pretty minimal considering how nice the apartment was. Spotless and the beds were very comfortable. The breakfast was at a different place a few blocks away. If I had it to do over I would not have paid for breakfast in advance. The location was right by the museums we wanted to visit. The decor was pretty funny. It was a very old lady, with lots of cream, pink, mauve, lavender. Our room was absolutely enormous and we joked about how we felt tiny in it. The bathroom had handrails and one of those open plan showers with nothing to step over. It would perfect for someone in a wheelchair. Very comfortable and big separate bed and livingroom with all features you would require. In the heart of the beautiful city of Dresden, you can reach everything with few minutes walk, rate for this room at this location is really reasonable. Our bed was just two beds put together and they weren't strapped together or anything so there was a big hole between us all the time. That was my only problem. Amazing place, room was clean and had everything we needed. I would personally give it some extra points for decorations in room, it added that cozy feeling and you really feel like you are home, not in a hotel. Personal was very helpful and friendly, they speak english very well. You can also leave your baggage on reception after your check out, if you want to wonder around a city a little bit more. Everything was perfect and I'll definitely come back. We were upgraded to a beautiful apartment with an amazing view. The beds were very comfortable! Underfloor heating too!